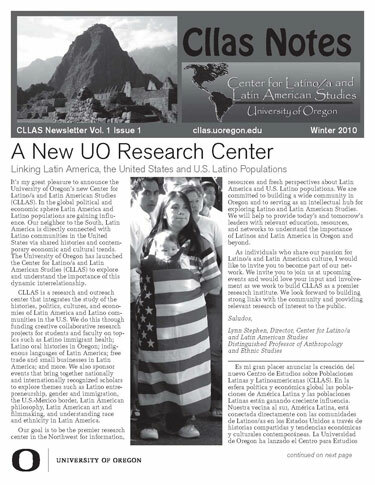 Re-Thinking Open Spaces: making the City of Eugene’s parks and community centers a more welcoming and inclusive place for its growing Latino population. 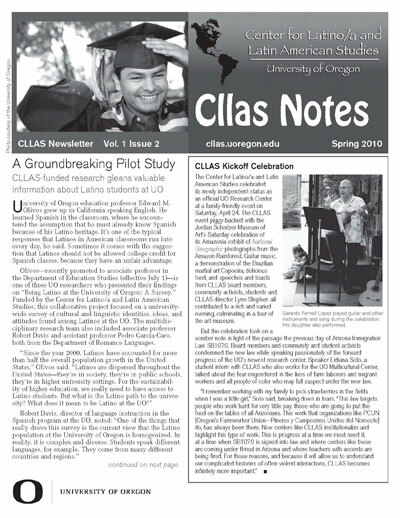 Graduate and Collaborative Research Projects detail farmworker testimony; traditional building vs. concrete block in Guatemala; inhibitory control in the bilingual brain. 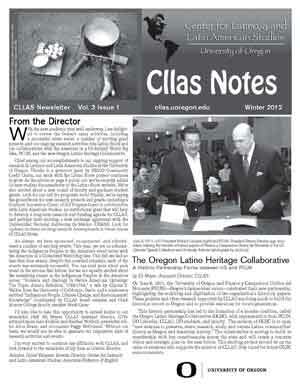 Director Lynn Stephen and Associate Director Gerardo Sandoval share new action-oriented CLLAS projects. 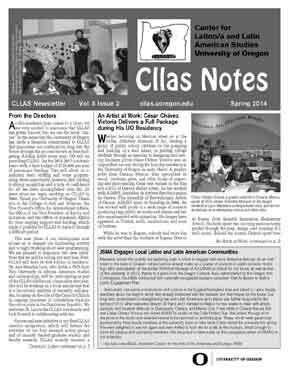 News about CLLAS-related celebrations and publications, including books and documentaries by CLLAS associates. 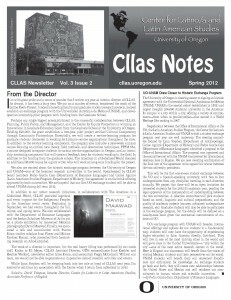 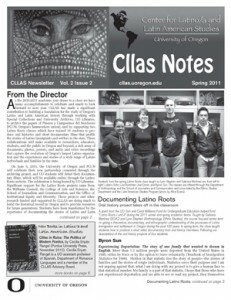 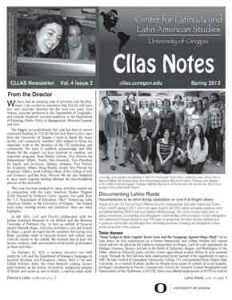 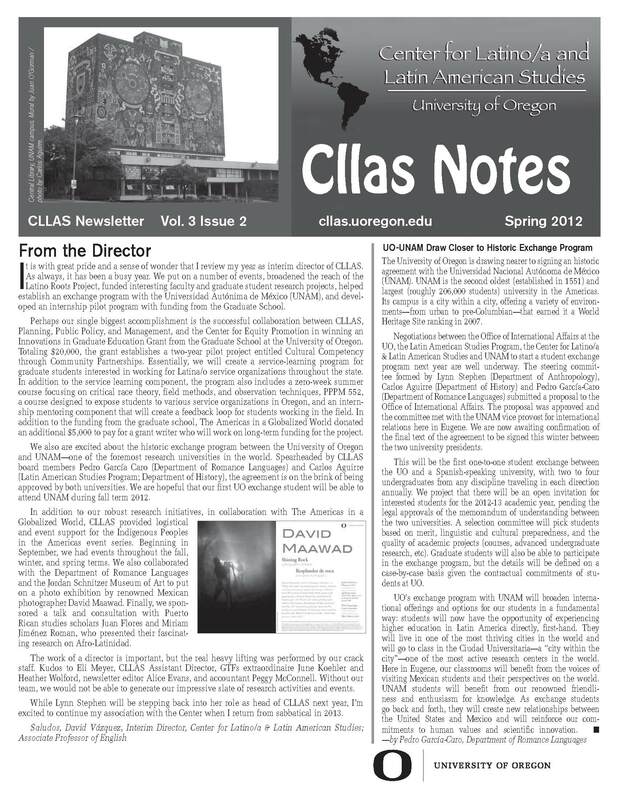 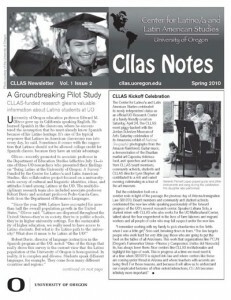 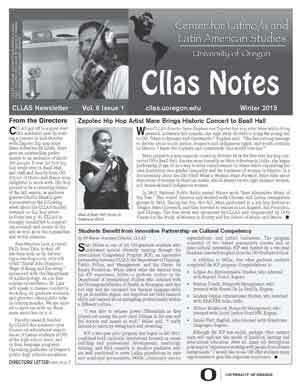 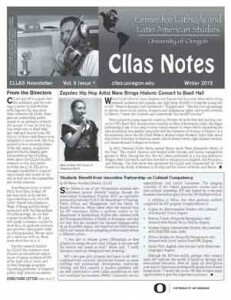 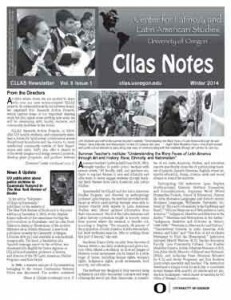 Reports from faculty and student grantees on their CLLAS-funded research, including civic engagement in Medford, Oregon; impacts of education in Guatemalan women’s microcredit programs; implications of free trade on women in Colombia’s cut flower industry; a historical look at the North American Spanish borderlands of Florida; and more. 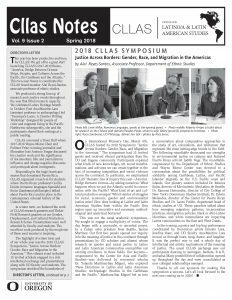 Director’s Letter—Director Lynn Stephen reviews the activities and development of CLLAS during academic year 2012-13, including the securement of continued funding for CLLAS and the selection of two associate directors. Project reports from students of the 2013 winter/spring Latino Roots class—three students write about their work on oral history documentaries. 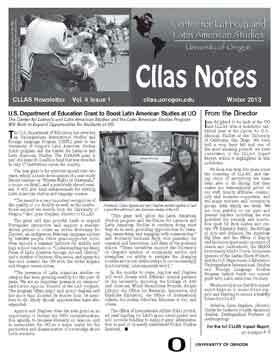 Vision statements from new CLLAS associate directors Lise Nelson and Gerardo Sandoval. 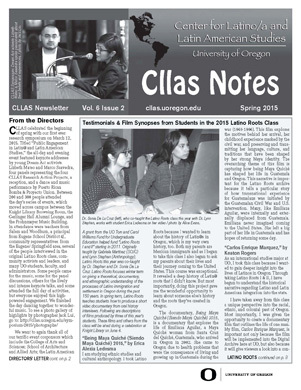 Reports from faculty and student grantees on their CLLAS-funded research.